Mugen is to Honda what your depressingly superior little brother is to you. No matter how awesome and successful you are as the older sibling, no matter how smart or how fast, he somehow shows up later and does it better and with more style. 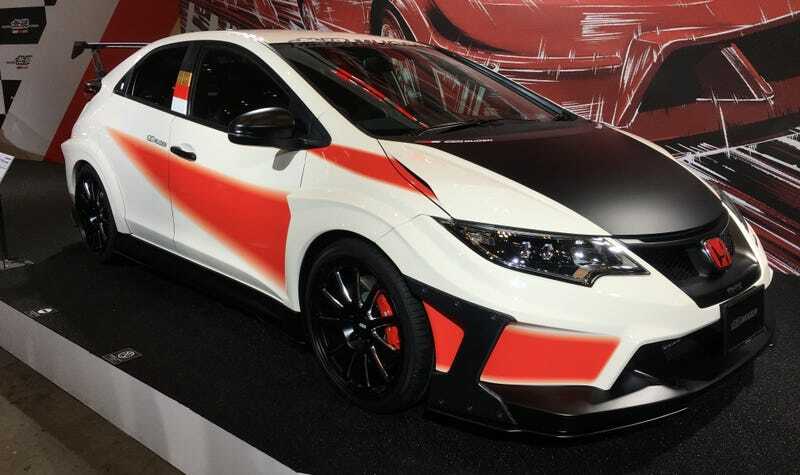 Yeah, the Mugen Civic Type R is pretty much like that. The sibling analogy is an apt one, because that’s basically what Mugen is. It’s only a sort-of independent company started by Honda Hirotoshi, son of legendary Honda founder Honda Soichiro, in 1973. And although there was a Modulo Civic Type R on display at TAS 2016, no one had any damns to give, because the Mugen CTR put it to shame. Meh. See? No crowd around the Modulo. BORING. What have you done for me lately, Honda? Better exterior (although I admit, I probably would take off the decals once I finished stealiーI mean, borrowing it from Mugen), more aerodynamic front bumper, nicer steering wheel, Mugen interior... Oh, and neither of those silly looking fender-vent things. They’re not real, so there’s no reason to have them. And Mugen’s CTR doesn’t. And that’s just the outside. Don’t forget, there’s well over the base 306 horsepower in that Mugen motor, and Mugen ditched the quad-exhaust of its previous CTR for a single, hefty, but not super large exhaust. It’s nice—you can see it, it makes a nice rumble, but it also looks functional. It’s fair to ask with something the size of the CTR: are four exhaust pipes really necessary? Probably not. Both the Mugen CTR and the Modulo CTR wore the same Mugen rims, but being that the Mugen is, well, the Mugen, the answer to the question “Who wore it better?” is obvious before you even ask the question. Yeah, your standard CTR bores me. Your European CTR? Not worth mentioning. Mugen has seriously upped the game. Okay, Spoon... Your move.